Richard Florida once lived in Columbus so when he calls this city “a living petri dish” he knows what he’s talking about. If this sounds vaguely insulting, I promise, it is not. Florida was invited to Columbus, along with Jeff Dyer and Sir Ken Robinson, to speak at Innovate Columbus, the annual conference organized by Tech Columbus and Innovation Fisher and also one of many events (TEDxColumbus is another) that made up the eleven-day celebration of innovation and design, known as idUS. 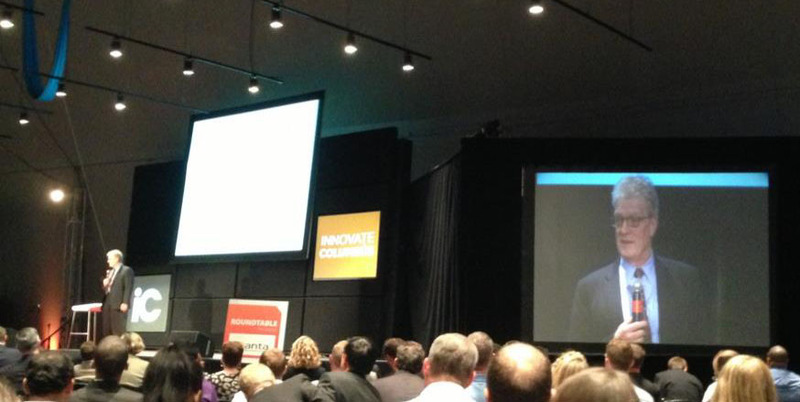 Innovate Columbus was slotted for day 7 (last Thursday) at COSI. Florida, first up, addressed the local (mostly) business community on the subject of creativity and economic vitality and how Columbus is, and could be, incubating both—thus, the petri dish. As the superstar urban theorist sees it, our Columbus environment is ripe for growing the “goods” needed in the new, and still taking shape “post-industrial knowledge economy.” Remember, he’s lived here so he’s not just being nice. He’s also done the research. Our ground is fertile, he says, because it has three key ingredients and in almost the right proportions: technology, talent and tolerance (The 3 Ts). Also, through a process of “patching and stitching,” Columbus has rebuilt its urban center, and this, in combination with already existing “innovation pods,” means Columbus has what Florida calls “the institutional fabric” to cultivate, cross-pollinate and bring ideas together to “mate and replicate” and, thus: INNOVATE. After Florida’s stirring call to action, the next keynote was Jeff Dyer. The strategy scholar has been studying so-called disruptive innovators, of which Steve Jobs is the exemplar. His purpose is to look for clues to enhance the potential for innovation. What he’s found are five key attributes: Associating, Questioning, Observing, Experimenting and Networking. There are nuances to each—read his book for more—but, for example, successful questioning has a lot to do with the quality of the question. Two suggestions: “Ask good questions that impose constraints” (ex: What would we do if today we lost our current income stream?) and “Ask good questions that eliminate constraints” (ex: What would we make if money were no object?). Before Sir Ken’s keynote, the 400 or so attendees were given a half hour break, which I used to try out Questioning. So far, in this day’s discussion, the innovator is synonymous with the company. But if one is not a CEO, not a partner, nor extremely loyal by nature, what are the necessary ingredients in the petri dish for the individual worker to be part of this innovation process? You might say the ingredient is a given: “No one can hoard creativity,” says Florida, “smart is open and open is smart.” Yet, anyone who has tried to institute one knows that workplace change can unsettle the ranks. And, it is not necessarily easy, nor always prudent, for anyone to let his or her baby go off to “mate and replicate.” Not without trust anyway. But that is an ingredient in short supply when there is job insecurity, massive pay disparity, patent abuse and, as the librarian next to me pointed out, unclear intellectual property laws. Dichotomous labeling of workers as innovators OR executors—as was heard at this conference—doesn’t help much either. In his keynote, Florida argued that the old economic model is a mismatch for current conditions, as is the old model of suburban life. “We are groping for a new way of living,” he says. Which makes me wonder, then, in this new post-industrial knowledge economy, won’t we need new models for labor and organizational structure? What might they look like? And, within these new models how will our beloved ideas about incentives and competition do? Will they match or mismatch? But, here it is already 4:00 and time for Sir Ken Robinson. Some may know Robinson from his 2006 TEDTalk “School’s Kill Creativity.” It is the most watched TEDTalk ever—though, as his daughter points out, his numbers still pale in comparison to that cute kitty video going around Facebook. Robinson is a leading thinker on and instigator of creativity and innovation. He is also a knight. While his perspective has far-reaching relevancy to, for instance, business, education, and government, Sir Ken never strays too far from the human being making his or her way through life. Robinson isn’t exact about how to seed creativity in individuals within institutions (for that it would probably take a consultant’s rather than a speaker’s, fee) but his shared ideas on imagination, creativity and organizations can at least get us started. After meandering, comically, through topics like German verbs and French teachers, Robinson began his keynote by putting some substance to the term “creativity.” He did this by first talking about imagination, the ability to see something that is not there—and, because we can imagine ourselves in others’ shoes, imagination is also, he says, “the seed of empathy.” Creativity, then, is essentially “applied imagination.” More specifically: “it is the process of having original ideas that have value.” And even more specifically: “original” doesn’t mean it has to be new to all of humanity, but it does have to “bend your mind”; and what constitutes “value” is tricky, best to keep your criteria open, after all, as Robinson asks, how do you judge if there is no point of reference? There is something else quite crucial about creativity: If you are a human being, you have it. “It comes with the kit,” he says. Also, it is expressed in every part of life—math, housekeeping, painting… Essential, though, is to be a person/parent/organization that cultivates it. Unfortunately, there seems to be no shortage of “institutional culprits” (like, for instance, traditional education) that squelch it. —Schools are based on conformity, but life is based on diversity. —The English say Americans do not get irony—it’s not true, but I think you should know people are saying this behind your back. Proof that Americans do get irony is No Child Left Behind. —…it confuses raising standards with standardization. —…they have a wonderful little boy called Dylan, after Bob Dylan…why not Bob? The man can bend a phrase. His wit can shift the view and his sharp insight is reason enough to give that view a good long look.